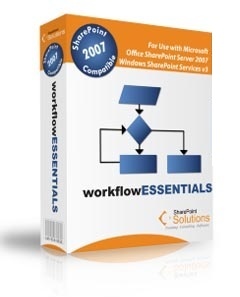 Workflow Essentials by SharePoint Solutions is a suite of activities and conditions that enables users to create effective, useful Designer workflows in SharePoint. It empowers SharePoint Designer Workflows for a fraction of the cost of other solutions. However, many of these same companies quickly discover that although the plumbing is there to create robust workflows in SharePoint, more tools are needed to effectively automate their processes. SharePoint Solutions, a national leader in Microsoft SharePoint products and technologies training, consulting and add-on software, has released Workflow Essentials, a cost-effective, reliable way to augment Microsoft Office SharePoint Designer workflow capabilities. Workflow Essentials is a suite of activities and conditions that enables users to create effective, useful Designer Workflows in SharePoint. "Nearly all organizations that implement SharePoint® seek to automate business processes by taking advantage of its workflow capabilities," said Tony Bierman, senior software engineer for SharePoint Solutions. "However, many of these same companies quickly discover that although the plumbing is there to create robust workflows in SharePoint, more tools are needed to effectively automate their processes." Bierman noted that companies can either pay programmers to author custom workflow activities, or they can purchase an expensive third-party add-on for workflow. SharePoint Solutions' Workflow Essentials provides an alternative, with a proven, reliable way to augment SharePoint Designer workflow capabilities for a fraction of the cost of other solutions. SharePoint Solutions' experts have spent thousands of hours consulting for companies with various workflow requirements and teaching students how to better leverage SharePoint workflows for process automation. "By working with our customers and students to understand their business needs, we have developed a SharePoint add-on product containing custom workflow activities and conditions for SharePoint that users will find indispensable," Bierman said. Workflow Essentials installs on SharePoint servers and provides several new activities and conditions for use on the design surface of Workflow Designer in SharePoint Designer. There is no additional workflow design application to install or learn; users simply continue using the familiar SharePoint Designer interface for creating their workflows. With Workflow Essentials installed, users have about two dozen additional activities and conditions from which to choose. These activities will allow workflows to create SharePoint sites; move and copy list items; query user properties from both SharePoint and Active Directory; send e-mail attachments; manipulate item permissions; and much more. Cost is $1,995 per web front-end server. Versions are available for both 32-Bit and 64-Bit platforms, and the product is compatible with both WSS v3.0 and MOSS 2007. Based in Nashville, Tenn., SharePoint Solutions has been a nationwide leader in expert-led public classes on SharePoint products and technologies. The company's software division professionally develops high-quality commercial add-ons for SharePoint, including the award-winning Extranet Collaboration Manager for SharePoint 2007. For more information, visit http://sharepointsolutions.com.